Not surprisingly there are certain combinations that create “good” days and others that have more depressing affects. Of course, everyone has their own version but I wanted to see what universally works. For instance, some people will tell you to get up early – but that doesn’t work for everybody. I really like to sleep in especially if I played hockey the night before. But if I feel guilty because I’m “supposed” to get up at 5 or 6 am then I’m already starting off in the wrong direction. I get some of my best insights at 2 o’clock or 3 o’clock in the morning so getting up at 6 am the next morning is just not happening! I’ve applied all 9 of the main components on this list at various times with various degrees of results – but not always in a daily way that’s been with intention or consciousness. That’s why I created my own daily checklist to help ensure I’m on the right path, and now by sharing it, I have even more accountability of making sure I ‘walk the talk’. From everything I’ve applied, studied, and done for the last 2 decades, I’ve put together these 9 ‘M-Power’ categories or if you’re into rhymes like “If the gloves doesn’t fit you must acquit” then go with “Divine 9”. What you take meaning from nourishes you. For some people it works best to wake up and read, watch or listen to something inspirational. It could be religious, spiritual or self-development focused. Or perhaps its prayer in a traditional or non-traditional way. One of my favorite ways to create more meaning is to recount what you are grateful or thankful for today. 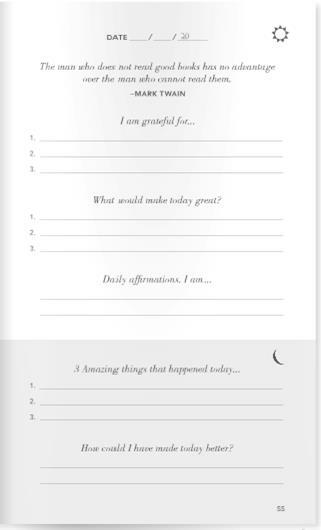 There’s a cool journal called ‘5-minute journal’ that will give you a simple place each day to write down what you’re grateful for each day and night. If you don’t do journals this is a good one to start with. Your meaning is directly tied to your emotions. Viktor Frankl wrote Man’s Search for Meaning giving his account for creating meaning from his imprisonment in a Nazi concentration camp. If you have not read or not read it in awhile, it’s well worth picking up. The only thing that sustained Frankl in the concentration camp (unlike so many others) was seeking meaning, wisdom and teaching from his situation. Creating a reason that something occurred gives us more strength and resilience. Interestingly enough, I was on a flight to Johannesburg to work with Virgin Unite and then going on Safari. And sitting next to me was a gentleman who shared his story with me. He was in the ANC and was picked up for demonstrations against apartheid. Before being given any attorneys or due process, he was tortured and forced to make a confession against his friends. But when the time came for his trial he would not confess. So back into jail he went for 5 years this time. It was the same jail where Nelson Mandela spent so much time at Robben Island outside Cape Town. My seatmate told me he could have come out 2 ways from prison. One being bitter and broken or more resolute and convinced that apartheid needed to be ended. It’s a pretty incredible story of how meaning drives our lives. His name is Luyanda Mpaphway and today he’s one of the most prominent architects in South Africa designing embassies and other iconic buildings. I asked him if he had confessed if he thought he would be where he was today and he told me flat out – ‘NO’. You can combine categories together too like ‘Mix’ and ‘Meaning’. Imagine how you would feel sending out a personal handwritten note to someone you are thankful to (My very first post was about the power of handwritten notes and they work in a big way!). Your meaning will soar using them and your connection will deepen. One of my favorite new books is by my friend and Silicon valley entrepreneur, Kamal Ravikant. The book is called Love Yourself Like Your Life Depends On It . Get it on Kindle or a paperback version. It’s awesome! And for bonus extra credit points you can do a slightly ‘weird’ exercise Kamal recommends. This is just one piece – you need the whole story of how his business was crumbling and his self esteem was in the crapper. I don’t want to ruin it here. Don’t be a cheapskate – get it yourself. The notion of loving myself and everything that entails is a central theme that landed on my front page of my most recent journal to focus on. Another powerful piece you can incorporate into your daily practice under Meaning is forgiveness. Forgiving yourself or someone else in your life can have such a glorious response. I’ve seen some very close people to me live with anger and pain because of a supposed wrong inflicted on them. We all have ‘wrongs’ against us but the energy it takes to remain angry at someone creates a permanent bond of negativity. You’re not hurting them by keeping that anger inside. And this past summer I’ve taken to swimming, and I’ve got my first stand-up paddle board from Underground® speaker, Stephen Aarstol’s Tower Paddle Boards, of course. (BTW – we’re coming up on our 10th anniversary celebration Underground event and if you want to attend as a VIP go here.) Also, a bit on-and-off Missy and I have done yoga. I’m a big fan of that combination of movement – intention and breath work here. It doesn’t have to be super rigorous and truly anything is better than nothing. If I realize I haven’t done much movement in a day, then I will make sure I knock out some push-ups before bed or maybe a few pull-ups. Anything helps. (Actually here’s a cool article on a 7-minute scientifically proven routine with only your body weight. Or maybe it’s making that call you dread. Firing that team member you know that has to go, etc. If there’s something that really scares you – do it! 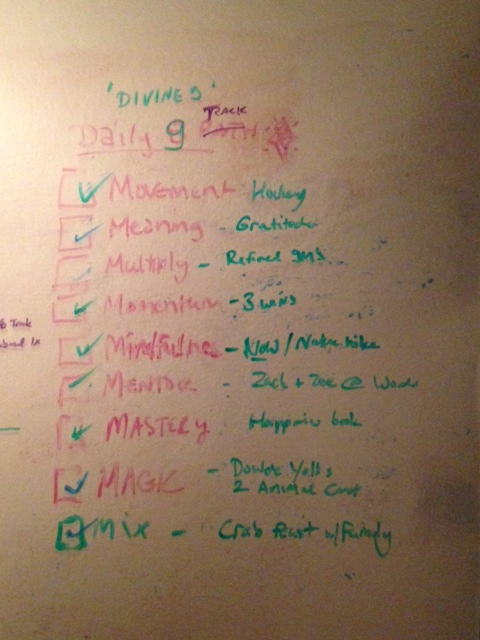 Create easy daily habits to develop your mastery muscle. Even something as simple as making your bed counts. I’ve never made my bed for years, either Missy did it or I simply left it unmade. (I mean why bother since you’re getting right back in it that night?) But after a entrepreneurial monk named Dandapani at my friend Jayson Gaignard’s MasterMind Talks event – I have committed to making my bed each morning. It sounds a little dumb but there’s power here. Your daily habits could be as simple as flossing your teeth each day. Set yourself up with daily habits that empower you. The biggest part about mindfulness is your intention. It’s the difference between actively engaging and manifesting what is around you or simply letting things happen to you by default. Now don’t get me wrong, there are many times I prefer to be in ‘flow’ moments where I see what happens next or let my intuition guide me – but that’s happens with mindfulness too. 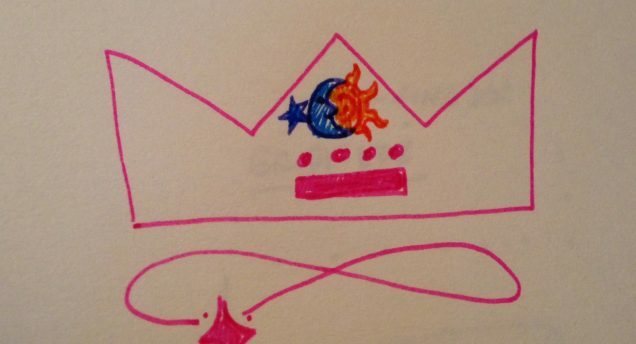 (I know it seems circular but it’ll make sense.) The fact is, your intuition only speaks in the quiet space in between your mind chatter. It’s these ‘flow’ opportunities that are created from simply ‘being’ mindful and aware. Originally this was only Mentor but this missed the natural state of giving AND receiving. These mentor type opportunities can be found daily if you look for them or are aware of them. With my kids, I look for ways to incorporate a value lesson in some way that’s not preachy but simply part of our everyday lives, conversations or even part of some sort of game. We’ve been playing Cashflow for Kids game, and that provides ample conversation time about passive income versus working at a job. Dan Sullivan of Strategic Coach explains that people being disappointed because they cannot reach their “ideal”. Dan sets up his days that he only has 3 things to accomplish. That’s it. If he gets more done that’s a bonus – but 3 important things. There’s tremendous momentum from checking an item off your list, especially if its something proactive and moves you forward. Conversely you need to look at what’s on your to-do list. Some things just need to be removed forever and again there’s powerful progress here by deleting. Imagine that you believed and saw the magic in your everyday life or simply created it. How much more spectacular would your life be each day? It can be something as simple as just laughing. Whether that’s laughing over dinner with friends, watching a comedy or practicing ‘laugh yoga’. I’d love to know how you apply these. In the morning, I’d start with what I’m grateful for and fill that section out. Then see if you can hit 3 things during each of the parts of the day. Just write in which one it is. i.e. M __ovement____ and then what you did. great article…totally agree, am just actually writing up a post on the importance of learning a variety of things to stay in balance myself. As for the numerical meaning — infinity? Thanks for this great info! This fits right in with a project i’m working on regarding the mindset for happiness/appreciation. And I’d like to see Halelly’s 365 worksheets! This article was gold, Yanik. Our life paths are very similar (or seem to be). I’m especially impressed by your inclusion of mindfulness, a topic many business folks fail to include. Really appreciate you sharing all these insights, Yanik. Gave me a lot of useful ideas. In regards to #2. Movement, I’ve found an old ayurvedic technique involving breath work that you might enjoy. It’s the one thing that has made exercise sustainable, and I’m 62. It allows you to transpose the calming and energizing effects of yoga into any sport or exercise activity. And it can transform even a boring chore like shoveling snow into a blissful, refreshing workout (hard to believe, I know). I’ve had runners, cyclists, bodybuilders and tennis players use it with great results. Contact me it you’re interested. It only takes a few minutes to learn. Awesome post Yanik on living a life of design rather than living a life of default! I’m working on a book right now called “7 Habits of Highly Successful 7 Figure Bloggers” (Yes, I’m including YOU!) and after interviewing some 7-figure income earners I realized it’s really about the habits they have that make them massively successful! 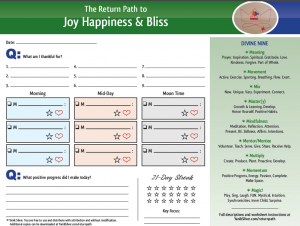 Like Zig Ziglar says: “Motivation gets you going and habit gets you there.” Well done post and I love the PDF download and am using it right now!!! Journaling is really important – and as funny as it may sound, doing it in your non-dominant hand really slows things down so you focus more on what you are writing while also using parts of the brain you don’t normally use. This simple addition has worked wonders for me. Could it be the number of redemption you are thinking of and the eternal flame? Thanks for your very well conceived and constructed share. It’s a great gift to share what’s tried and true along your path to a more intentional life. I’m digging the Divine 9! Yanik, I love the worksheet. Thanks for the great ‘give.’ And I love the lists and all the M’s. In particular I like your points in Mindfulness and Multiply. The 2 millimeter shifts of going from unaware to self-aware and from consumer to creator are life changing (and correlative). Nicely done. Thanks again. Great post, Yanik. I have been really working hard at saying no to things in the future and even though I am heavily committed in the present I can see the daylight coming and see how it is going to give me the freedom, creativity and energy to accomplish some of my larger dreams. Thanks for the PDF. “Life Path Number 6” – the number of responsibility and awareness. “Life Path Number 1” – hard working, a natural born leader, a pioneering spirit that is full of energy, and a passion for art. 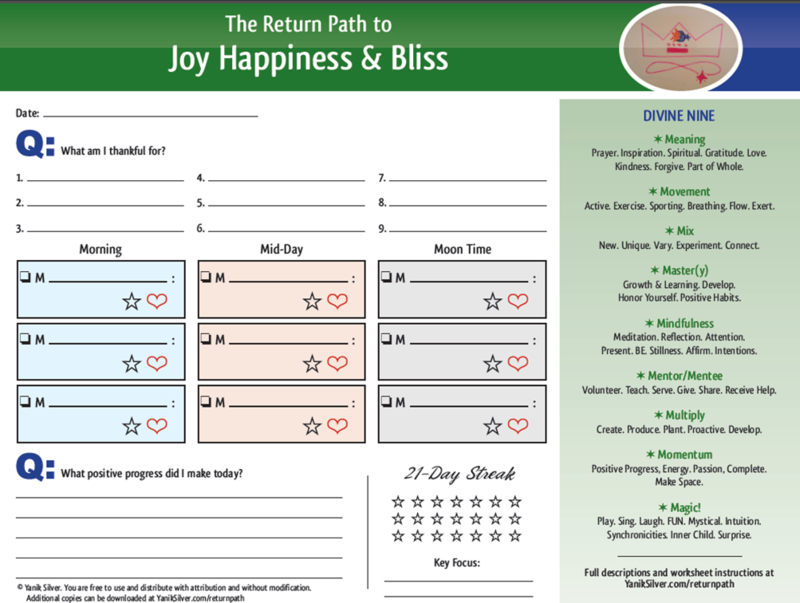 I appreciate you creating the Return Path to Joy, Happiness and Bliss. I’m a recent college graduate and have been struggling to figure out if I want to find a job with something I’m passionate about or trying to make money. I read a book So Good They Can’t Ignore You by Cal Newport to get me thinking the other way around with the ‘craftsman mindset’ to bring value to my job in every unique way. It really has helped. 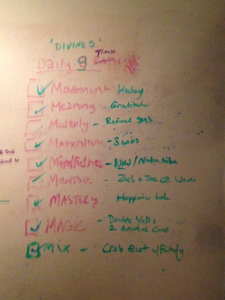 Anyways, I enjoyed doing your daily checklist of the nine M’s. I did find myself being more out there by trying to Mix it up and something Magic related. I liked starting my day off right with by being thankful and reminding myself the ‘key focus’ to help my breakthroughs of goals to achieve. The 3 main things I accomplished for the day helped made me feel better about myself and that I was on track. Every day I read one of your 34 Maverick Entrepreneur Rules to keep innovative ideas for the company I work. I love giving my boss those pointers. Look forward to your helpful insights.